Picture-in-Picture (PiP): This is the most noted feature of Oreo which allows you to do something else also without compromising the video you watching on your phone. This mode was originally a part of Nougat operating system, only available on Android TV devices but now it’s there on phones and tablets too. Users can customise the frame of the PiP also in addition to other functions like Play and Pause. Notification transformation: Android 8.0 Oreo brings notification badges which are exactly like notification dots on iOS. These dots appear on the app which hasn’t paid attention on and on pressing the app, the notification appears in a small box above it. Further, the snoozing system of notification is also remarkable which allows you to remember important things as per your desire of time. Autofill: This is a blessing from Oreo. It stores all your information like login details, address, card no. and will fill automatically for the apps or other services you download on your phone. The system asks you that you want to autofill the information or remembers it and once you choose the autofill option, the headache of remembering username and passwords for different apps vanish completely. New Emojis: Android 8.0 Oreo gives you the freedom to express yourself better with its redesigned emojis. They are over 60 in number and are way cuter and rounded than before. This includes fairy, mermaid, giraffe, wizard and many more. 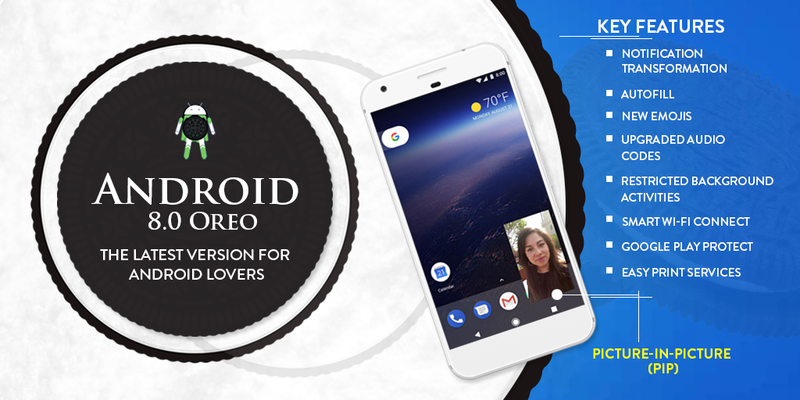 Upgraded audio codes: Oreo comes with LDAC Bluetooth audio codec and AAudio technology which offer superior audio quality to the apps that require “high performance, low-latency. ” This enhanced feature is like a cherry on the cake for the Android users. Smart Wi-Fi Connect: Here, you just have to go to the Settings and enable “Turn on Wi-Fi automatically” then this feature will automatically connect your phone to the nearest high-quality Wi-Fi and secures it with a VPN back to google. Restricted background activities: The operating system control the app functions running in the background thus saving a lot of battery which possibly makes your phone run little longer than the Android Nougat. Google Play Protect: It scans more than 50 billion apps a day including the ones which you must have not even installed also. The main aim here is to keep your phone safe from malicious apps, the ones which fall short on quality and security. Easy print services: The Android phones always require a third-party plugin for printers of different brands but now with Oreo, the issue is resolved. Google has partnered with Mopria to bring default print service to Android OS. Amos, 97% of printers in the market are Mopria certified printers and thus there are high chances that your printer is one of them. In addition to all these, the other features which make Oreo an incremental update are faster boot times, efficient file manager, streamlines setting menu, contextual press-to-hold option and adaptive icons. Oreo indeed has a long way to go where Pixel and Nexus users can update it right away and other users can wait for a while to delve into it.